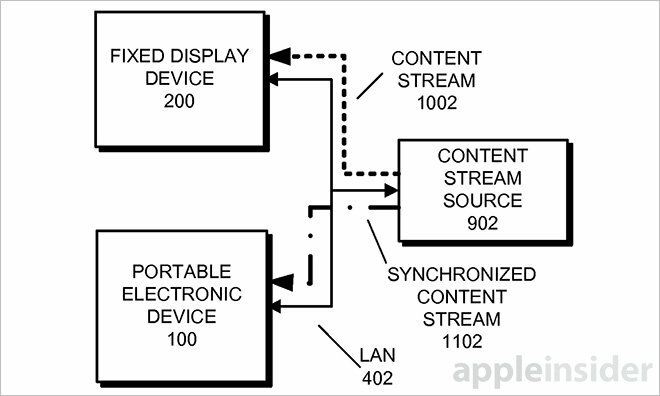 Apple on Tuesday was awarded a patent for displaying media streams on portable devices in synchronization with content being played back on a fixed system, suggesting the company is thinking of remote viewing capabilities for its Apple TV line of products. The U.S. Patent and Trademark Office granted Apple U.S. Patent No. 8,918,822 for "Displaying a synchronized instance of content on a portable electronic device," which lets iOS device owners view an Internet video stream synchronized to an identical stream playing on a fixed position device, like an Apple TV. Additionally, the invention supports mirroring from an Apple TV to an iOS device without entering service provider passwords. Apple imagines a familiar scenario in which a group of people gather to watch a movie or TV show provided through a streaming service such as Netflix or Apple's own iTunes store. When someone leaves the viewing area, the group may pause the stream until they return, or keep the presentation going and let the person miss out on programming. 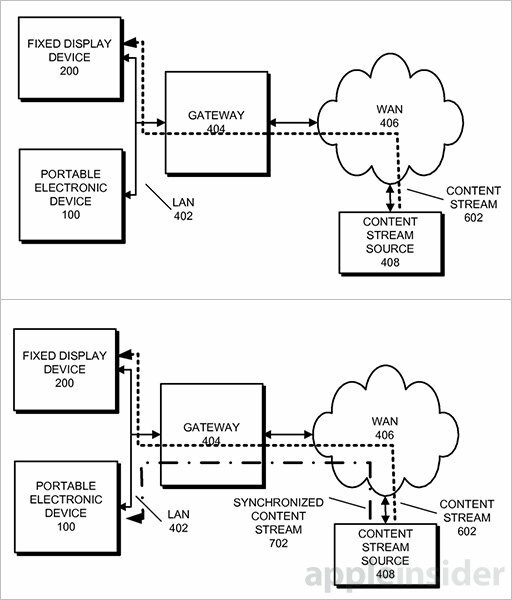 To solve this less than ideal user experience problem, Apple proposes a system that uses a portable device to locate the source, name and timestamp of media being streamed to a streaming device, then plays back said content in lockstep. In some embodiments, viewers must manually search for and input media streams, while other implementations conduct the process automatically in the background, allowing for immediate and seamless playback whenever it's needed. In a primary embodiment, the system does not rely on Apple TV to serve up content, but instead routes data requests regarding current playback position and source information to retrieve the stream independently. If after gathering the necessary data an iPad or iPhone determines it can access the stream directly, it will begin synchronized playback. A second embodiment covers situations in which a viable source cannot be accessed. For example, the party leaving the viewing area may not have proper service provider credentials or has not downloaded a third-party app that supports synchronized playback. In these cases, a user device can request a synchronized mirrored feed directly from an Apple TV unit. 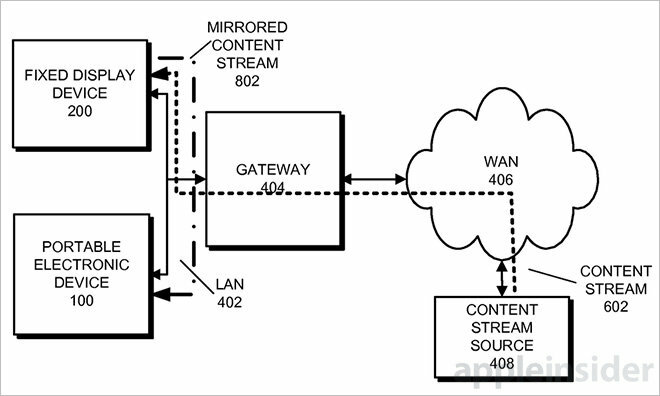 As applied to Apple's patent, mirroring is essentially a reverse implementation of current iOS-to-Apple TV AirPlay technology. 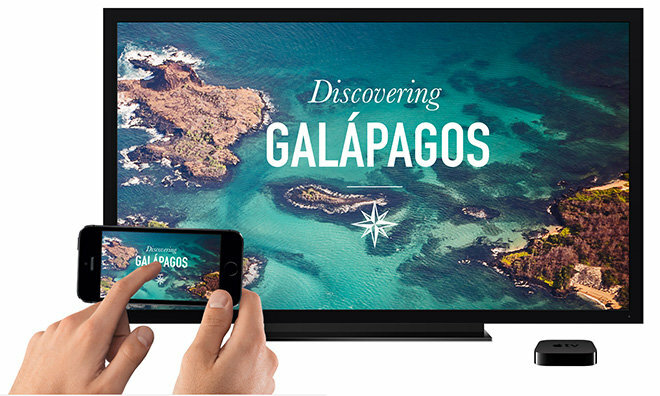 Currently, AirPlay allows connected devices to stream video, photos, games and more to a television via Apple TV. In addition, peer-to-peer AirPlay functionality allows guest devices to connect with Apple TV without passwords. It is unclear whether Apple plans to integrate remote viewing technology into Apple TV's feature set, but a working solution could potentially be rolled out on the back of AirPlay. Mirroring from Apple TV onto unregistered devices may be more of an issue, however, as content rights owners are generally reluctant to expand secondary user viewing beyond existing standards. Apple's synchronized remote content streaming patent was first filed for in 2012 and credits Devrim Varoglu and Swapnil R. Dave as its inventors.